Maximum size: about 250 mm. 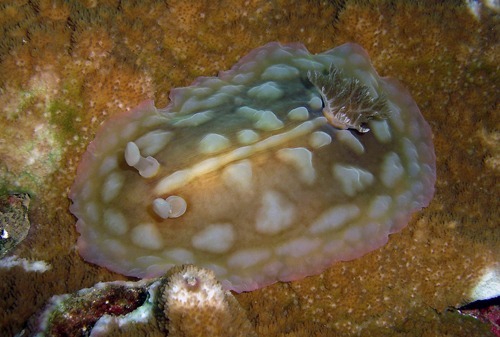 Identification: This is a large mound-shaped dorid with a distinctive sculpted appearance. The notum is smooth with large raised ridges and tubercles. There is usually a mid-dorsal longitudinal ridge flanked by compound tubercles that are often rough "mirror images" on either side. The tubercles become smaller marginally. The margin is thin and translucent, sometimes edged in pink. The color varies from light yellow to caramel to grayish tan with the tubercles and rhinophores a light cream or pale yellow. Its gills appear to change from light tan during the day to chocolate brown or blood red at night. Distribution: Big Island, Maui, Molokai, Oahu, Kauai and French Frigate Shoals; widely distributed in the Indo-Pacific. Taxonomic notes: The name means "forming dense clumps," in reference to the large groups of tubercles on the notum. It is referred to as the "clumpy nudibranch" in Hoover, 1998 & 2006. It was probably first reported from Hawaii in Pease, 1860 (as Doris foetida). Photo: PF: 93 mm: Kamaole, Maui; Dec. 15, 2006.